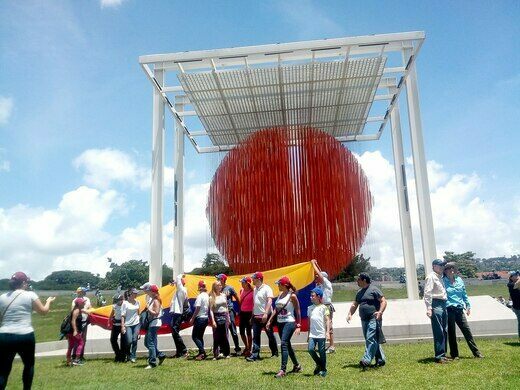 The Esfera Caracas, or Caracas Sphere, is a kinetic sculpture made from a series of aluminum rods, which together form what looks like a large orange ball hanging in the air. Dr. Farid Mattar's Monument of Peace. Ruins of the laboratory where a mysterious doctor invented an embalming fluid and stored his mummies. In 1994, the acclaimed Venezuelan sculptor and painter Jesús Soto began making inquiries about one of his sculptures, which had seemingly disappeared. 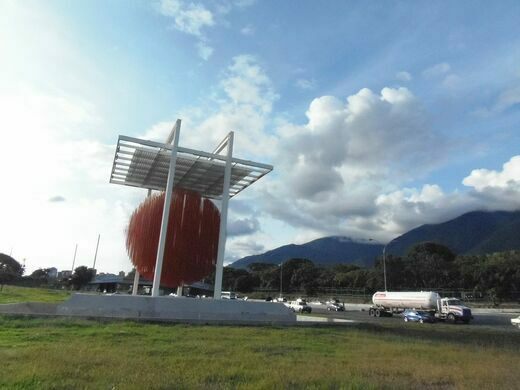 The piece—a kinetic sculpture resembling an orange sphere—had been commissioned by the Federal District Governor’s Office, but had never seen the light of day. With the help of some friends in high places, Soto, famous for his op art and kinetic works, began the hunt. At the time, Venezuela was going through a rough patch. Hugo Chávez was in prison after an unsuccessful coup d’état, and the collapse of Banco Latino had created a banking crisis. Finding a lost piece of art wasn’t a priority, but Soto and his friends eventually found it in a government storage space. The problem now was where to put it. In the end, it was the First Lady of Venezuela at the time, Alicia Pietri, who found a place for the sculpture. Pietri, a dedicated patron of the arts, childcare, and urban improvement, had found a spot along the Francisco Fajardo Highway, not far from La Casona (the official presidential residence) and a nearby airbase. And so the Esfera Caracas finally had a home. 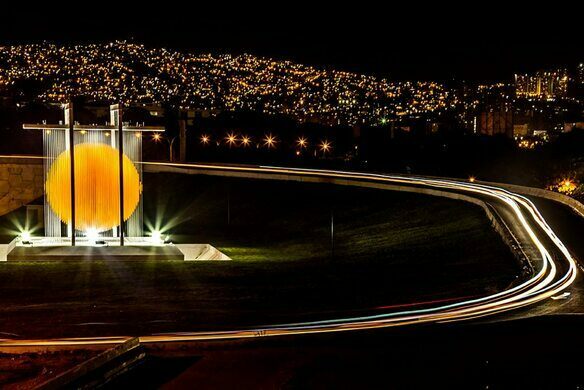 It was inaugurated in 1997 and soon became a cultural icon of Caracas. Like other works by Soto, the Esfera Caracas is a dynamic piece whose appearance differs depending on the viewer, as well as the elements. The sculpture is made from 1,800 three-quarter-inch hollow aluminum rods, suspended from a 39-foot-tall metal gantry on a concrete base. The suspended orange-colored rods create what appears to be a sphere suspended in the air, which seems to move or shimmer with changes in the light and the wind. For eight years, the Esfera Caracas stood along the highway, a famous landmark for people driving by. But in 2005, vandals began to destroy the piece. The lack of lighting at night, the absence of any watchmen or caretakers, and the ease of access to the sculpture made it an easy target, and soon the vandals had stripped away most of the aluminum rods. The frame stood all but bare, a sorry sight indeed. Soto had died earlier that same year, but the Soto Foundation, along with the cultural association PDVSA La Estancia, was determined to save the Esfera Caracas. Since much of the sculpture had been stolen, however, the only option was to go the Ship of Theseus route and rebuild the sculpture rod by rod. And while they were at it, the restoration team added new security features, a modern lighting system, and a new garden. Soto’s sphere had been reborn. In 2014, another problem arose. The widening of the Francisco Fajardo Highway and the construction of the new La Carlota Bridge meant that the Esfera Caracas had to be moved. So the whole thing was disassembled and reassembled 1,500 yards further along the highway, to a slightly higher location that offered better views of the sphere. 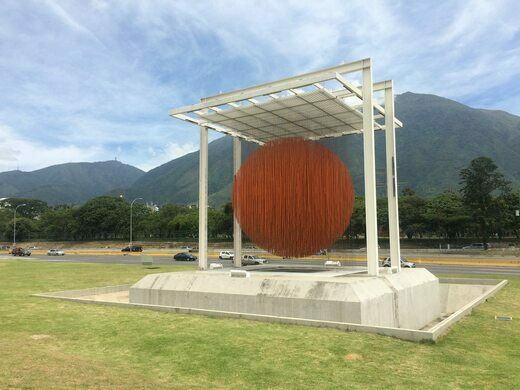 And that’s where the Esfera Caracas stands today, its orange sphere shimmering by day and by night, one of the most iconic sculptures in Caracas and arguably the most famous work by the late Jesús Soto. The Esfera Caracas is located along the Francisco Fajardo Highway, between Aeropuerto Francisco de Miranda and Generalísimo Francisco de Miranda Park. The sphere is actually in a space in the middle of the highway, so walking there isn’t ideal. You can, however, pull off the highway and park in the small parking lot near the sphere, after which you can explore and take photos at your leisure. This former shopping center now acts as the eccentric lair of the Venezuelan secret police and their shadow prison. A trough of 700 strange bronze faces runs through a narrow alley in Ljubljana's old town. One of the famous Czech artist's lesser-known Prague installations appears to be a glowing fetus affixed to a drainpipe.